A quick rundown of what we know about what happened last night. Eaton Centre, after police arrived on the scene. One Dead, Seven Injured After Shooting at Toronto Shopping Mall. Curious onlookers stand around a TV monitor. Police rush from St. Michael's Hospital, where several victims were taken. Toronto Police outside the Eaton Centre. Toronto Police Constable Victor Kwong updates the media. A lone security guard walks inside a deserted Eaton Centre. Mayor Rob Ford speaks to EMS officials. Mayor Rob Ford walks with his communications director, George Christopolous. Mayor Rob Ford speaks to officials. Police Chief Bill Blair speaks with his officers. Police Chief Bill Blair speaks to media outside the Eaton Centre, while Mayor Rob Ford looks up. File photo by Christopher Drost. Mayor Rob Ford walks with Police Chief Bill Blair and other officials. Last night, at around 6:30, numerous witnesses heard several (perhaps as many as 15) gunshots while they were working or dining in Eaton Centre’s newly renovated food court. People left the mall right away, or otherwise remained inside locked storefronts until they could evacuate safely. 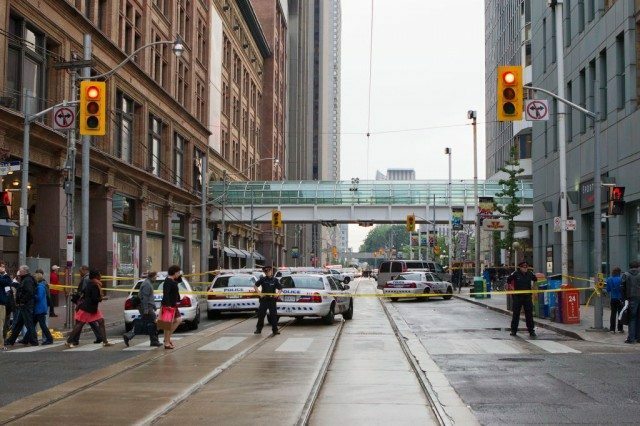 Police spent several hours on the scene, shutting down traffic on Yonge, Queen, and Dundas streets until they could get the situation under control. About two and a half hours after the incident, police confirmed one death and seven injuries related to the crime. Police say the deceased, a 25-year-old man, appears to have been the target of the shooting. The other people who were hurt, officials believe, were merely unlucky. The Eaton Centre is closed today as the police investigation continues. Possessions of shoppers and employees are reportedly locked inside. People who left their cars in the mall’s parking garages last night have not yet been able to retrieve them. There is no word as to when the mall might reopen. Whoever pulled the trigger has not yet been arrested. Police officers had a working description of the suspect that they were circulating among themselves last night (see our liveblog for details), but so far the Toronto Police Service has said nothing officially about what the shooter (or shooters) might look like. Above, a gallery of photos from last night. They’re in roughly chronological order.